To make it simple for you to see what’s inside our baby food, the amounts of the main ingredients are clearly listed right on the top of our package in a way that’s visual and easy to understand. 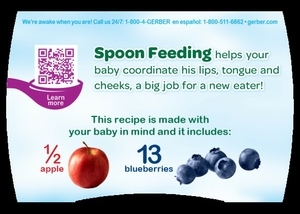 You can find it now on our 2nd Foods® fruits and veggies, and our 3rd Foods® Lil’Bits™ recipes sold in plastic tubs, and over the next year we are putting these recipe equations on all of our pureed baby foods. The above image is an example of how the top of our 2nd Foods Apple Blueberry looks today.